The body is made of a wood called Bubinga, which I have never heard of before, with a mahogany neck and rosewood fingerboard and bridge. This was my first experience of buying from a guitar shop, as my previous two guitars were bought from Argos and over the internet. I felt a bit embarrassed trying things out in the shop and playing very badly. But it is a small shop and the staff were friendly. I quickly eliminated two guitars, a dreadnought and an electro-acoustic. The first felt bulky and awkward to play, the latter sounded too bright. That left two others which felt similar to play and sounded similar so it was hard to separate. In the end I decided to go with the more unusual design (and it also had the biggest discount!). I will post some videos of me playing once I have got used to it (I can't play some bar chords for now). Here is my electric guitar, an Aria STG-003. It was part of a beginner's pack bought over the internet. I know many people on the forum say that these beginner's packs should be avoided, but I hadn't discovered www.justinguitar.com at the time so I didn't know any better. 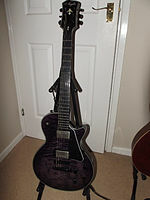 I am actually quite happy with the guitar, but I don't really have anything to compare it with as I have only briefly tried one other electric guitar . I needed to fix the intonation, but that was all. The amp that came with it, an Aria AG-10 is awful. Not knowing anything about guitars or amps, I then bought a Digitech RP-150 multi-effects pedal to get a better tone. I use that all the time, but I am aware that the tone isn't always good. A new amp is definitely on my shopping list. Your Aria looks an awful lot like my strat. Your strat has a maple fingerboard, whereas mine has rosewood, but the body looks the same colour. I am sure yours sounds better as it is a Fender. I think mine was made in Korea. Just received my new Blackstar HT-5R amp. This is the new 2011 version with reverb added. I will try to do some sound clips soon, once I have got used to it. You can't do much with the tone if the amp is fundamentally crap. Have you tried the RP150 via headphones? Also, you can plug the USB into your PC and record via it. @ Keith - Before getting the Blackstar, I did use the RP150 with headphones most of the time and also used the USB cable for recording. I used my old amp just as a loudspeaker really. I will still have to use the old amp for going to the guitar class at college, as the Blackstar is a bit big. @ close2u - even my wife noticed the improvement over the old amp. Most noticeable is the improved bass response. It is going to take a while to get the tone just right. I am not quite sure where to put the RP150 in the setup. I still want to use it for its tuner, metronome/drum machine and probably for delay effects. I didn't really use the other effects much, other than the amp modelling, distortion and eq, which I probably won't need to use now. For the tuner, I will just plug my guitar straight into the RP150 and it doesn't need to be connected to the amp. For the metronome, I may be able to plug it into the MP3 jack. For delay effects, I think it has to go in the FX loop. It's mine! Hopefully it will arrive next week. Surprisingly I was the only bidder. Now I have to fend off questions from my wife about what I am going to do with my old guitar. Now that's a bargain at 300 Squids ......... You get a new Agile, without all the bother of having to import it yerself. I will try to put up some pictures and sound clips as soon as I can. The finish looks a lot darker than it does in the photos because of the flash. First impressions - it is heavy! Bending seems very easy. The finish on the fretboard seems very different to that on my Aria. I am not quite sure how to describe it, it just seems smoother somehow. The intonation is a little bit out, so I will wait until I have fixed that before posting any sound clips. I'll also need to get some new strap locks as my old ones don't fit. Now I am going to play some blues! That fretboard doesn't look right to me, at least not in these pictures. Waaaay too smooth, like the previous owner used silicon or wax on it. 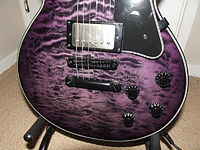 So when you take it in for a setup, have the tech/luthier look at it. She does look pretty damn good otherwise though. One well meant hint; if you start with upgrades at any point, replace the pots, toggle, caps and wiring first. That'll do a LOT for tone improvement.